No, this is not an introduction to a Kevin Kostner film about the Native American Indian experience. This is a photograph of the Asian American experience – Dances With Lions. Last week Sunday, when I visited the egg cream/egg roll festival in Chinatown. I got exposed to cultural practices from both the Jewish and Chinese American communities. It was an exposure of music, food and religious practices. On Eldridge Street, the stalls were lined with pickles on one end and dumplings on the other. There were outdoor musical scores being played, first by the Chinese community and then later by the Jewish community accompanied by traditional dance. However, the music that caught my attention was further away at a nearby park just of Canal Street. I could not ignore the beating of the drum nor the beating of the cymbals. So with much curiousity, I made my way to the park where I observed a traditional Chinese Lion Dance being performed. It was just the sort of outdoor experience I was hoping for. I had always seen puppet shows performed on a small scale; This was the first I had seen it on a grand scale. Everything was well choreographed, the movement of the mouth, the winking of the eye, the synchronized movement of the legs. It was all well done. It was all accompanied by traditional Chinese music. To some degree, I felt sorry for the performers. It was 81 degree weather and it was sweltering. Consequently, the performers could only do two performances with the costume on and it was later followed by uncovered performances. But, it was the covered performance which resulted in the photograph taken here. As stated before, this was not a review of the movie Dances with Wolves. It is a post which was inspired by the merger of the Jewish and Chinese communities’ egg cream/egg roll festival. 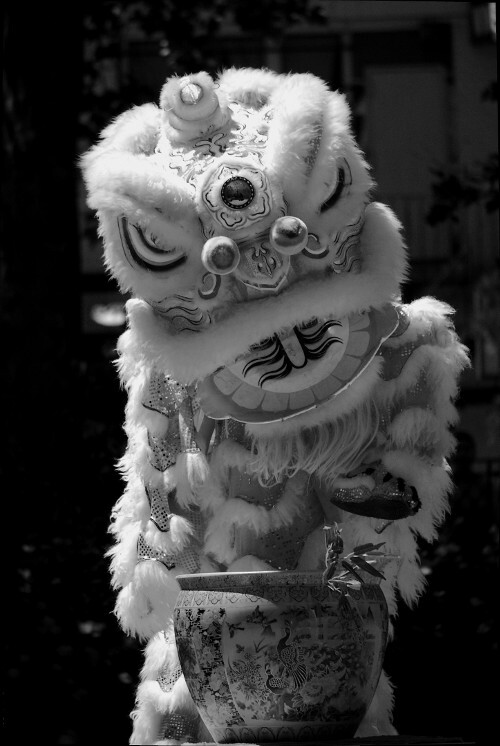 Although it was the egg cream/egg roll festival that attracted me to the city, it was the Dances with Lions which stole the show.